Excluded mass region on the plane of the low-mass Higgs boson mass (vertical axis) and the charged Higgs boson mass (horizontal axis). 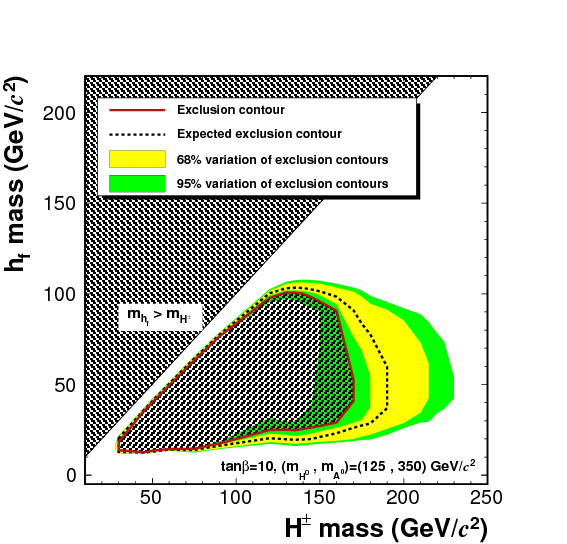 The solid curve is the contour enclosing the exclusion region; the dashed line encloses the expected exclusion region when no new Higgs boson is assumed; and the shaded (colored) regions cover the 68 percent and 95 percent level of possible variations of expected contours based on the statistical fluctuation of the standard model background events. In 2012, the ATLAS and CMS experiments at CERN’s Large Hadron Collider discovered a new particle. The mass of the particle, the Higgs boson, is now known to a very high precision: 125.09 ± 0.21 (stat) ± 0.11 (syst) GeV/c2 (combined measurement from the CMS and ATLAS experiments). It seems to be consistent with the last missing piece predicted to exist by the Standard Model of elementary particle physics and considered to be responsible for assigning masses to known elementary particles. Some evidence for such a new particle had also been presented by the CDF and DZero experiments at the Tevatron. Last year CDF and DZero presented additional evidence that the Higgs boson, an electrically neutral particle, had the spin and parity predicted by the Standard Model. Is this the end of the story? Many particle physicists believe that the Standard Model is not really the fundamental physics law of the universe, and scientists have proposed a number of new models (the model we consider was first proposed in 1979) to expand the Standard Model in many different ways. Some models assume that there are brothers or sisters of the Standard Model Higgs particle. For example, there could be other electrically neutral Higgs bosons and even charged Higgs bosons. This analysis examines a possibility that yet another new Higgs particle with a smaller mass could still be uncovered. It must look very different compared to the Standard Model Higgs boson because it has escaped from all previous searches performed in various experiments around the world. In fact, this analysis assumes that the new low-mass neutral Higgs boson does not interact with particles constituting matter. (It is said to be fermiophobic.) Such Higgs bosons could have been produced in pairs in proton-antiproton collisions at the Tevatron and would be expected to decay essentially 100 percent of the time into two photons. What makes this analysis new is that we search for pairs of such particles by requiring three or more photons. 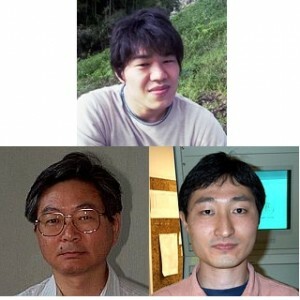 The primary analysts for this measurement are, top row, Atsunari Hamaguchi; lower row from left, Toru Okusawa and Kazuhiro Yamamoto, all from Osaka City, Japan. Not shown is Yoshi Seiya, also from Osaka City. After all cuts were made, five events were found. The Standard Model predicts 2.96 ± 0.08 (stat) ± 0.94 (syst) events. This analysis looked for a hint of the new particle in the full CDF Run II data set and found everything was consistent with Standard Model predictions. The final result is shown in the upper figure as an exclusion region in the plane of the the charged mass Higgs and the low mass neutral Higgs (hf).